Terra Diver was released in the same year like Battle Garegga, and although it plays in a similar world, it's quite different. First of all we have a horizontal screen here which scrolls vertically. The graphics consist of pre-rendered Bitmaps and polygonal 3D elements. It's an interesting mixture which gives the scenery some depth with complex looking details. 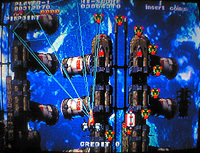 The player chooses one out of three spaceships which belongs to a specific character. The ship comes with an individual weaponary and some kind of a radar that marks the enemy ships within, when holding the [A] button. By releasing the button, all locked targets automatically get overrun by homing weapons such as laser storms or rockets in order to destroy them. The [B] button drops smart bomb. It destroys within a single radial range, unless there are some targets locked to attack first. With the [C] button, the player can switch between two different lock-on systems. The story of Terra Diver plays in different times of the near future, located in space, then in the earth orbit, followed by a nice looking (Terra)-dive down to the earth's surface. The bosses are quite spectacular, featuring nice 3D effects when they are attacking. Unless other Raizing / 8ing games, Terra Diver runs on a cartridge based hardware system from SEGA, the ST-V Titan arcade board. This board is basically a SEGA Saturn with more RAM. It might be interesting to know for collectors, that both language version are in the same ST-V cartridge of 'Soukyugurentai / Terra Diver' . 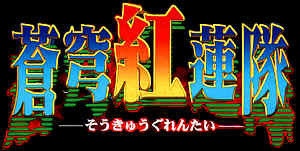 The game appears in japanese language (as Soukyu Gurentai) or complete in english with an english 'Terra Diver' title screen (see screenshots), depending on the country of origin of the motherboard (Jap. or US) you use for running this game cartridge.